The Cold War ended in the late 1980s in a way that surprised many. In the early years of that decade, the risk of nuclear war was perceived by many to be on the level of the Cuban missile crisis in the 1960s. This period was followed by dramatic disarmament, including weapons of mass destruction and conventional weapons. Disarmament was the result of negotiations but also, to a large extent, of unilateral decisions. After a decade of military focus on peacekeeping and peace support operations, the attention of the international community after 9/11 focused strongly on counterterrorism. In parallel, significant attention was given to individual cases of suspected and/or documented horizontal proliferation (notably Iran, Iraq, Libya, North Korea). Russia started to rearm from the late 1990s following a period of frustration partly related to a perceived decrease in international influence. In the first decade of the millennium the US focused largely on a case-by-case approach seeking to bring 'rogue states' into line and to deny terrorists the access to nuclear weapons. Still, the NPT review conferences in 2000 and again in 2010 reached important conclusions of relevance to nuclear disarmament including its humanitarian aspects. — 80. The Conference, while welcoming achievements in bilateral and unilateral reductions by some nuclear-weapon States, notes with concern that the total estimated number of nuclear weapons deployed and stockpiled still amounts to several thousands. The Conference expresses its deep concern at the continued risk for humanity represented by the possibility that these weapons could be used and the catastrophic humanitarian consequences that would result from the use of nuclear weapons. There was a new determination on the part of the Obama administration to reduce the role of nuclear weapons and make an effort to promote the creation of a nuclear weapon free world. The most visible example of this determination was the Obama speech in Prague in 2009. After 2010, however, the international security environment turned much worse. One significant event during this period was the Russian annexation of Crimea. Russian action taken against Ukraine was in violation of the Budapest Memorandum of 1994 where Russia (and also the US and UK) had guaranteed the sovereignty and territorial integrity of Ukraine in exchange for Ukraine giving up its nuclear weapons. Still it was possible to reach an albeit time-limited nuclear agreement with Iran through cooperation in the Security Council with a leadership role for the European Union. And as regards non-proliferation, the case-by-case approach focusing on rogue states was back on the table under the new Trump Presidency. The United States defined its position on the basis of its national interests and decided to go back to sanctions against Iran and to abrogate the Iran deal for its part, with as yet unforeseen consequences. Scientists are still arguing, in a way reminiscent of the climate change debate, about whether even a limited nuclear war will have wider and more long lasting indirect effects than previously understood. The possibility that even a war between two states operating on the level of minimum deterrence could threaten life on the planet as a whole is now being debated openly. This means, as noted, that the capabilities of all nuclear weapon states are of relevance to global security, and not only in terms of the possible proliferation of conflict from one region to another (In this context it is worth taking into account that North Korea has a direct border with the Russian Federation). "In 2007, a study by Alan Robock and other scientists in "Atmospheric Chemistry and Physics" estimated that a "limited" nuclear war involving just 100 Hiroshima-sized bombs could have a devastating effect on the world's food supply. An updated study published by the Physicians for Social Responsibility concluded that more than two billion people could end up threatened by reduced food stocks after just such a "limited" exchange of "low-yield" weapons (the study posited an exchange of warheads between India and Pakistan). This means that a "regional” war would kill more people in less than a week than died in the whole of World War II. Two billion dead from starvation would be a few hundred holocausts." The visibility of this argument was strongly promoted during three conferences held in Norway (2013), Mexico (2014) and Austria (2015). As a follow-on to this debate a more contentious issue arose as to whether the humanitarian consequences merited a commitment not to use nuclear weapons under any circumstances. This led, in turn, to an intensive debate about how international law and international humanitarian law should be interpreted. For the nuclear weapon states this signaled that the humanitarian initiative was going to be exploited in order to stigmatise existing nuclear doctrines. The mounting frustration over the absence of efforts to implement the commitments from the NPT Review in 2010 was followed by the elaboration of the TPNW in 2017. The International Campaign to Abolish Nuclear Weapons (ICAN) developed the necessary momentum to negotiate a treaty prohibiting nuclear weapons together with a core group of states (Austria, Ireland, Brazil, Mexico and South Africa) very much on the basis of the humanitarian initiative . For this ICAN was awarded the Nobel Peace Prize in 2017. The mounting frustration over the lack of progress in nuclear disarmament negotiations as promised under Article VI of the NPT led to the decision to go for an urgency approach in two stages. This decision was taken by a core group of states promoting the TPNW in close cooperation with the International Campaign to Abolish Nuclear Weapons (ICAN). It should immediately be noted, however, that once the decision was taken and the negotiations became an intergovernmental, civil society had limited access to the negotiations and influence on their outcome. In many ways it is most likely that the outcome was a somewhat different from what many in civil society had expected. This Inquiry has registered the view that the operative part of the treaty became too complex to be explained in simple terms, that a more general prohibition of nuclear weapons would have been sufficient. In supporting a reframing of the conversation, the idea was to open nuclear disarmament policy-making to new voices. The focus of attention was a treaty on the prohibition of nuclear weapons, rather than on prohibiting the use of nuclear weapons. The idea was also to promote change, to promote action on the part of the nuclear weapon states, their allies and all other states, organisations and individuals assisting in some way in implementing nuclear weapon programmes and policies. To do this, a new treaty was deemed to be necessary. This treaty should not seek to eliminate nuclear weapons with an extensive text filled with definitions and detailed provisions. Instead the idea was to produce a political treaty that could constitute the basis for legal and political pressure on the nuclear weapon states by making nuclear weapons illegal. For this to happen a significant number of states had to participate in the negotiations, but not necessarily the nuclear weapon states themselves or their allies. The idea was to go for an early ratification of a treaty with enough state parties to change international law. But a treaty could not be developed by civil society. This work was in the hands of states. The core group of countries that had been cooperating with the Campaign for a number of years took the work in hand and elaborated a text that was put to a vote in the UN General Assembly after less than a month of negotiations. A large percentage of the paragraphs in the text were simply copied from other treaties, with few, if any, changes. Almost all the 122 states participating in the negotiations did so with two overarching objectives in mind: The treaty should not include any additional commitments for the initial state parties. At the same time, maximum pressure should be exerted on the nuclear weapon states and their allies. The end result was a complicated legal text with a very wide scope of prohibitions and with no definitions. This wide scope was well suited to putting political, and eventually also legal, pressure on non-parties to the TPNW, i.e. the nuclear weapon states and their allies. What is the TPNW about and what were the Swedish expectations? This is not only a Treaty about nuclear weapons. It is also a Treaty stigmatising both nuclear weapons and nuclear weapons-related policies, including deterrence and nuclear umbrellas. 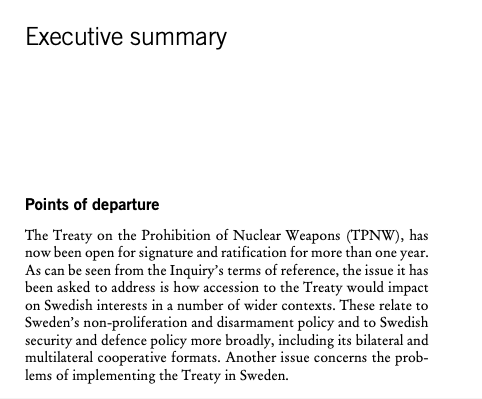 In several respects it is not the Treaty Sweden hoped to see evolve during the negotiations in which it participated, putting forward a large number of amendments, seeking to restrict the Treaty to nuclear disarmament. It was also in the expectation that such a restriction could be achieved in the future that Sweden voted for the adoption of the Treaty in the General Assembly while putting forward an explanation of its vote setting out what was described as crucial objections to the Treaty. Soon afterwards the Swedish government appointed this Inquiry. The Treaty focuses on the long-term vision of a nuclear weapon free world. As noted, the main avenue proposed for coming to this point is through the normative impact created by a stigmatisation of nuclear weapons and policies. The examples of the Mine Ban Treaty and the Cluster Munition Convention as well as treaties banning other categories of weapons of mass destruction are used as examples of a possible way forward. It is hoped that this will be an equally effective model that also leads to the eventual elimination of nuclear weapons. But at this stage this is not a Treaty about the elimination of nuclear weapons, as was the case for the Chemical Weapons Convention which came into force a few years after the end of the Cold War. That convention was a very detailed document with many definitions and institutional provisions. The current Treaty is devoid of definitions and does not focus extensively on verification. At the same time it is a Treaty with an extremely wide scope. Again, this is a configuration that was criticised by Sweden in seeking to promote a treaty of verifiable scope, with clear definitions and adequate verification on the level currently developed not least in the NPT context and in the context of the CTBT. Sweden voted in favour of opening up negotiations on a treaty during the General Assembly of 2016. This position was based on the concern, later also expressed in the Swedish national security strategy, over the deadlock in international nuclear negotiations as symbolised by the failure of the NPT 2015 Review Conference and the fact that the Comprehensive Test Ban Treaty had still not entered into force. But Sweden already introduced a number of questions about the process at this stage. In particular, Sweden did not subscribe to the notion of a legal gap in existing treaty law that had to be filled. The NPT remains the indispensable cornerstone of nuclear disarmament and non-proliferation. The decision to participate in the negotiation was followed by some 20 proposed amendments to the convention text. Only one of these proposals was accepted, and this led to a Swedish explanation of its vote with, as noted, a number of what were termed crucial objections to the treaty text. However, given the significance of the overall objective, Sweden voted in favour of the resolution moving the Treaty to the next stage for signature and ratification. But at the same time Sweden signalled its intention to conduct a thorough inquiry into the consequences of accession to the Treaty. Similar inquiries have been underway, officially or non-officially in a number of other states. The Treaty on the Prohibition of Nuclear Weapons was opened for signature on 20 September 2017 by the Secretary-General of the United Nations. This was yet another historic opportunity for international disarmament when a whole category of weapons could be prohibited. In this sense it followed in particular the remarkable achievement from 1992 when chemical weapons were prohibited. This time, however, the process towards a ban was more difficult and the level of expected accession to the Treaty was far more limited. There is little prospect that this Treaty will become universal in the foreseeable future. When the TPNW opened for signature on 7 September 2017 a total of 53 states did sign the Treaty and a few of them either ratified immediately or proceeded to ratification during the following months. As a rule these were states belonging to nuclear weapon free zones in different parts of the world with no nuclear programmes in the civilian or military sectors of their own. In addition, European countries that signed at an early stage were outside military alliances and had no previous nuclear civilian or military history. For the TPNW to enter into force 50 states are required. At this time 23 countries have signed and ratified. After having been negotiated in record time (less than a month), the Treaty, has got off to a slow start. The Treaty is still in a phase, when proponents of the Treaty focus on attracting as many state parties as possible. ICAN notably projects the information that all countries in the world with very few exceptions (the nuclear weapon states and their allies) will be compliant with the Treaty from the outset without a need to adapt their policies. This list of 155 countries includes Sweden. There is at present an unwillingness to discuss the issue of further development of the Treaty in terms of possible additional protocols and amendments as foreseen by the treaty text. So far, with few exceptions, signatories do not expect themselves to be affected by the Treaty in any significant way in terms of commitments and compliance. They are, by and large, already going to be parties to nuclear weapon free zones in regions sometimes very far away from nuclear hotspots. Most of them do not have any civilian nuclear energy programmes and only a few had any nuclear weapons related programmes in the past. They do not expect any significant costs from being a party since the Treaty does not propose establishing an institutional framework of importance. 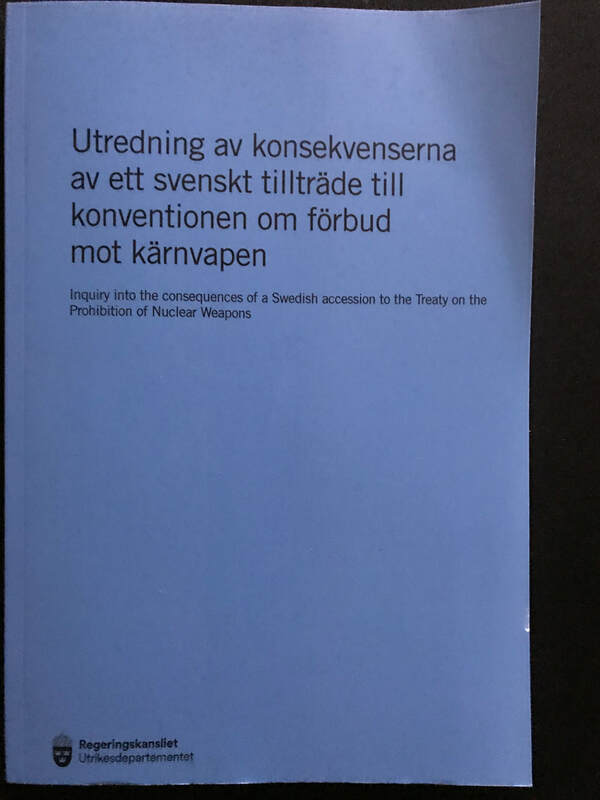 When questions have been put by the Inquiry about issues that are important for Sweden and that complicate Swedish accession, the same answer has been given with minor variations: with few exceptions the amendments proposed by Sweden were unacceptable to the bulk of the negotiating states and are not likely to be taken up for renewed scrutiny by state parties any time soon. The fact that around half of the countries that supported the Treaty in the General Assembly have not yet signed can of course signal that they are considering the consequences of the Treaty in a way similar to this inquiry. It can also be the result of counter-pressures against signing the Treaty. In any case, this Inquiry is convinced that the current phase of the Treaty bringing it to entry into force will need to be followed by a second phase. It is during this second phase that many of the questions discussed in this Inquiry will again be put on the table. This is not unique feature of this Treaty, but one also observed in the development of the NPT, where an additional protocol was negotiated during the 1990s. Amendments are more difficult to achieve in treaties that are close to universal. The earlier such amendments can be discussed in order to move a treaty to universality, the less difficult will be the ratification process of the amendments in question. The importance of a development of the Treaty depends on the perception of the role of the Treaty. If it is mainly viewed as a vehicle for influencing domestic political opinion in nuclear weapon states and their allies, the need might not be seen as obvious. What has not been very clear in the public discourse about the TPNW is that there are significant differences in how of the Treaty is interpreted by the ICAN and the countries that hope to be unaffected by the treaty. Taking one concrete European example: Austria has ratified the Treaty and, in so doing, the Austrian Government has notified the Austrian Parliament that no further commitments were imposed on Austria as a state party to the new Treaty. This was done after Austria had managed to avoid any explicit mention in the negotiations of the prohibition against financing of nuclear weapons programmes and transit of nuclear weapons. But this is not at all the interpretation of the Campaign to Abolish Nuclear Weapons. ICAN will most likely deploy an effort to develop its own understandings of the treaty prohibitions. A case in point is indeed the financing of nuclear weapons, which ICAN regards as being prohibited by the Treaty. There are likely to be further examples of ways in which civil society organisations will seek to operationalise the very general prohibitions of the Treaty. There are already examples of publications monitoring compliance with the Treaty on the basis of understandings developed by ICAN and its partner organisations. The list of derived prohibitions also include the issue of transit, which was not mentioned in the final treaty text, and subcritical experiments in laboratories leading to the development of nuclear weapons. As can be seen this is a different message from the one projected when seeking to increase membership of the Treaty. Including by the five nuclear weapon states Parties to the NPT: US, Russia, China, France and the UK. Including Austria, Ireland, South Africa, Brazil. Mexico and led by the chair of the negotiations Costa Rica.